One of my driving philosophies at Lime Design is that collaboration is the key in the product development field. Maybe a few years ago, it would have been normal for me to look at a business landscape in black-and-white terms. Competitors, prospects, deliverables, and profit. Stark, but simple. That doesn’t make sense to me in today’s design and manufacturing world. Everyone has their niche, even if they’re landing big accounts or making big waves. And sometimes, your success levels are skyrocketing. You need an extra hand to guarantee a client is thrilled or you’re ready for fresh eyes to show you new angles on a project that means a lot. The industrial design community – especially in South Florida, where we all know each other at least a little bit – benefits from working together. I make sure we foster a collaborative environment at Lime Design. Everyone’s input is appreciated. Everyone has something to contribute. And I see the opportunity for us to do more together across different studios, firms or verticals. We recently launched a partnership where we’ll be working with Ultimakers 3D printers. This is exciting to us, because we know these machines inside and out. We love using them in the studio and we’re very happy to be helping others get the most of them, too. 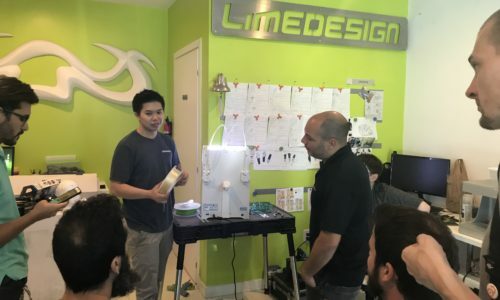 Lime Design is now collaborating with Ultimakers on equipment set-up, training and installation. At Lime, we’re super proud of how much we can do. Our studio in downtown Fort Lauderdale offers walk-in services at the front of the house. We have a confidential client area for planning. Our back of the house is dedicated to the market’s leading 3-D printers and other manufacture devices for our large clients and business partners. But we can still benefit from each other and grow together in the South Florida design and product development community. I don’t like to think in terms of “competition” when it comes to others who do similar work to what we do at Lime Design. Stuff like poaching clients or stealing ideas seems really outdated to me. We’re a collaborative industry by nature. I’d rather have a working relationship where we can give or take care of overflow for each other, pass on industry news, or just randomly talk shop and see what surfaces. We could decide that we’re all competition – why should one firm benefit from another’s work? – but, instead, I believe that our strengths are only worth anything when we share them. We remove common business fears from the equation in order to develop a strong relationships that serves both our client and our partners. As we continue to grow, we’re looking forward to deeper collaboration and a greater range of partners across all verticals. If you’d like to talk to us about collaboration, business development or vendor relationships, contact us now or just give us a call at (954) 234-7863.